Set within a purpose built block close to amenities, this two bedroom apartment offers well-presented interiors throughout with a private balcony and lift access. Percival Street is ideally located close to the amenities of Clerkenwell, Angel and Islington. The trendy bars, shops and boutiques of Upper Street are nearby. A quirky but intimate spot for live plays and music events. Home of London Symphony Orchestra! 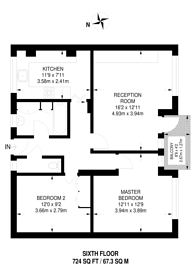 724 (67 Sq M) approx.